Where do the days go?! While we actually got around to putting up the Doodles page for March at the beginning of the month, we forgot to do a blogpost about them. This month’s doodle features a block called Birds and Star and you can download a colouring sheet here. 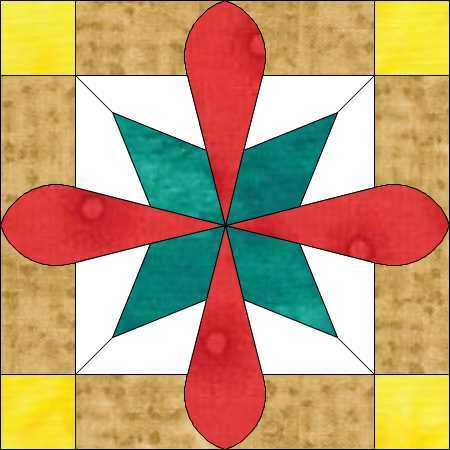 It has taken a long time to come up with the latest ‘bright idea’ but it occurred to us that as well as doing some colouring you might occasionally actually want to make the quilt – so you would need instructions to make the block(s). So now, over on our sister site – Meadowside Designs – you can find instructions and download templates for our March Doodle block. We have both been busy teaching at the Corner Patch this month. 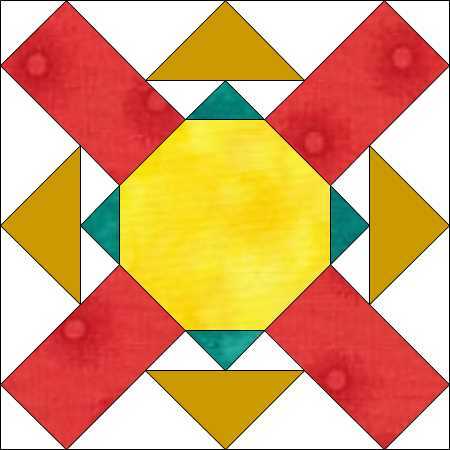 Barbara is using two of her vintage frame quilts in her hand-stitching classes and you can find the patterns on the Heritage Quilts Payhip site if you want to give them a go yourselves. Chris’s students are busy making a Block of the Month quilt which this year features blocks on a 5-patch grid by way of a change – you can find photos of progress over on Chris’s Instagram account. While we are on the subject of the Corner Patch – some of you may have heard some rumours about the shop. Jane has been making a regular appearance as a demonstrator on the Sewing Quarter TV programmes for the past couple of years – she’s been so good that they offered her a full-time job. She’d have have been mad to turn it down, but it does mean that the shop needs a new owner. So, if you have ever wanted your own patchwork shop – here’s your opportunity. The shop is based in Eccleshall, a thriving little market town in the middle of the Staffordshire countryside. It has a busy online presence too, as well as a team of teachers (we’re all excellent of course!) covering a wide range of classes and workshops. You can contact Jane via the shop website. Just to announce the arrival of our EQ Doodles for this month and also to remind you that there are still one or two places available on The Corner Patch Retreat later this month. Only yesterday, or so it seems, we were sitting with Jane making plans for this retreat and now it’s just a couple of weeks away. We’re really looking forward to reprising our tandem teaching on the Saturday of the retreat, it will be quite like old times!! If you want a colouring page for the doodles to while away a few sunny minutes in the garden (in between the thunderstorms) you can download one here. We’ve changed all the clocks and moved forward an hour but, in the UK, we don’t appear to have changed the winter weather. Chris has been marooned in the Executive Suite at C&B Towers watching the rain, cold and wind sweep over the surrounding park grounds and Barbara has got so cheesed off with snow rain and cold that she has packed up and left for the Overseas Office where everything is a little brighter and considerably warmer. . .
Lots of stitching in store for both of us this month as we make samples and storyboards for our Chris&Barbara day at The Corner Patch retreat – Chris started on one of her class samples and suddenly found herself finishing up a quilt top that wasn’t on the list (as you do). Barbara has fabric to starch, press and cut into a small stack of 10inch squares before she can start her share of the samples and then a whole new Layer Cake can be opened and used. And rumour has it that a certain Singer Featherweight might be taken out of it’s box and put to work alongside Chris’s trusty vintage Singer machine. If it’s February it must be just a bit nearer longer days and shorter nights and maybe better light to sew by (although it goes without saying that our sewing spaces are wonderfully illuminated with the very best of task lighting….). Chris has had such a busy start to the year with a full schedule of classes at The Corner Patch – not that much humming of sewing machines over at C&B Towers, just the whirr and clatter of the printing press as worksheets are put together. In other news our Electric Quilt Doodles page has been updated for the month – why not click over and take a look? And download the colouring sheet for a quiet coffee break. We’re late in wishing everyone all the best for 2018 – far too much Christmas and assorted merrymaking at both C&B Towers and the Rural Office. Now we can look forward to a very interesting and busy year of planning and stitching (not to mention the coffee). Chris has lots of classes booked at The Corner Patch, her monthly Wandering the Web column and quilts appearing in magazines, Barbara has classes at The Corner Patch and a mountain of UFOs to work through while she is in charge of the Overseas Branch. Spend a fun-filled weekend in the relaxing Staffordshire countryside, patchwork and quilting with expert teachers Chris Franses and Barbara Chainey. All meals and accommodation are included. Barbara has also made plans for a small handstitching retreat in May at the Overseas Branch – email ourhomesinspain@gmail.com for dates and details. And as if this all weren’t enough there’s an exciting new website due to launch on January 9th – ukqu.co.uk – if you register before that date then you will be entered for a prize draw to win a truly mega prize. Once the website launches you will find all sorts of things happening there – a Block of the Month, a Mystery Quilt, online shopping, hints and tips, guest bloggers each month (including Chris) and more. Registration is free so go and sign up, you have nothing to lose. You’ll find more information on their Facebook page – but again you need to register to join in the fun. In the meantime Barbara has managed to do some January EQ Doodles and there is the usual colouring sheet to download as well. Another two blocks for you this month – All Kinds and Paducah Peony. We also have a Summer Special to help you while away that time lazing on a sunny beach (we can but dream) – not one, not two but three colouring sheets to download. Sheet One is a combination of the two blocks and the others are the blocks straight set on their own. Don’t forget that you can have a lot of extra fun by cutting up the sheets and rearranging the blocks. Try putting them on point, or overlapping them perhaps? Download All Kinds here and Paducah Peony here. This month’s doodles feature those two favourites – Log Cabin and Courthouse Steps, together with Southern Star. 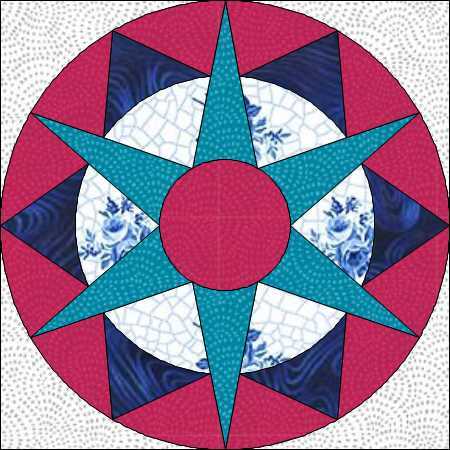 The colouring page is a simple 9-block set with the Southern Star block in the middle. You can download it here. Remember that you can print out the colouring page multiple times and then cut it up, rearrange the blocks, design your own layout to colour, as well as colouring in the layout we’ve given you. We reckon that more than half the fun of patchwork is playing around with the design and colour part – so put your feet up, have a cuppa and get colouring.